Released on August 2nd 2013 the Zoids Blu-Ray Box includes a box set of all 67 episodes of Zoids Chaotic Century and Guardian Force. The quality is an obvious improvement of the original but there are still some issues to be had with effects and the overall appearance. This set was released in two different editions. The regular edition was just the blu-ray box and the extras, while the Limited Edition came with a rare Kotobukiya Blade Liger cast in all clear plastic. The Liger looks fantastic but expect it to be brittle, especially if you're picking it up a while after release. Both sets came with a special edition 64-page Encyclopedia book. As far as I can tell this is an exact extract of the Chaotic Century section from the full Encyclopedia. It includes character and cast profiles, a few rough sketches, and some brief summaries of the Zoids and episodes. The size of the book is a bit thinner and smaller than the Viz Media English versions of Chaotic Century. If you ordered the Limited version of the Blu-Ray box you received a Blade Liger cast in all translucent plastic. The box featured the same artwork at the top of this article all washed in blue with no other colors. The sides were otherwise the same as the normal Blade Liger. In terms of quality the Liger is decent but be aware that it'll become exceptionally brittle with age. If you're going to get this Zoid then get it now and don't wait to get it built. The only part I managed to break was the face fins which are just as fragile on the non-holotech version, so this isn't a problem with the Blu-Ray Liger. This short feature is shown in the beginning of every disc. It serves as an opening and is the same for every volume. There were mentions of two different animation-related extras but this is the only unique video developed specifically for the Blu-Ray discs. That's not including poorly done screen shot slide shows, that is! Most volumes don't have any extra features. If you were hoping for the concept art and stuff from the DVDs, they're not on here. The last volume however does have textless openings, endings, and some brief cg turn-arounds of a couple of the Zoids in the shop. The DVD itself is the original Japanese version. There are no subtitles, closed captioning, or dual languages. It is Japanese only. This does have the added benefit of having all of the scenes that were cut from the Dub, including a couple of Zoid scenes. While some are as brief as only a second or two there are over 100 scenes that didn't make it into the United States so it's a nice bonus to have. There is the big question about what kind of video quality to expect from the blu-rays. The screenshots above show the Blu-Ray release on the left and the DVD release on the right. Undoubtedly the quality is substantially better than the DVD release, even at its worse. There is an odd filter effect over a lot of parts that looks like a smart blur. Many people have claimed that the DVDs are much sharper and while they may appear visually sharper the above image clearly illustrations how much detail is lost for the sake of that sharpness. Many parts are lost to blocky artifacts, especially on darker colors. While this isn't always noticeable from screen shots it is often painfully obvious when you're watching a Zoid actually move around. The effects of this filter is very obvious in the screenshot to the left. You will also see how large the full size quality of blu-rays are. They're at least twice the viewing size of the DVDs and retain the original square aspect ratio. It's also worth noting that the colors of the blu-rays are different from the DVDs. 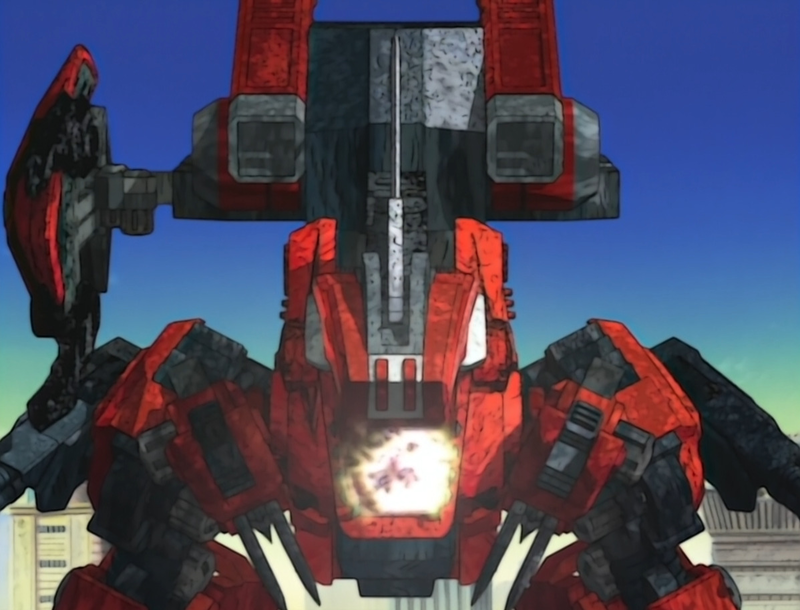 Saturation is stronger on the DVD release while the Blu-rays are more faded, but on the Blu-Rays red Zoids actually appear red instead of the orange.